The weekend after Thanksgiving is always a special one for my family. We are a FL Gator, Florida State split collegiate household. Let's just say, my side of the family is very happy the 2013 college football season is over. Year after year, Thanksgiving weekend has always been the same. Eat a lot on Thanksgiving, wake up super early to shop with my Mom on Friday, spend Saturday cooking for the big FL / FSU game, then eating more food. On Saturday, my Mom and I attended an in-store demonstration for Ore Ida Shredded Hashbrowns at Walmart to learn how to use this classic breakfast dish as a non-breakfast meal. There are countless hashbrown recipes you can make for holiday entertaining. 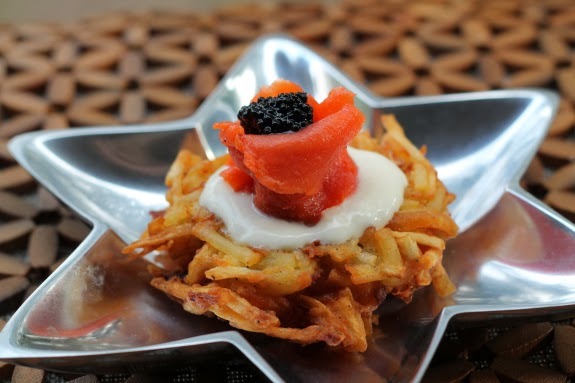 I decided to make Smoked Salmon Potato Latkes for my Step-Dad since Hanukkah also fell on the same weekend as Thanksgiving. This recipe was simple and delicious. There were zero leftovers and I will be making this a holiday staple. This recipe took 10 minutes to make with only 5 minutes of prep! Talk about easy holiday entertaining. Prior to making this, make sure your Ore Ida Frozen Hashbrowns are defrosted. If you forget to do this step, you can defrost them in the microwave in 1 minute increments at 50% heat. 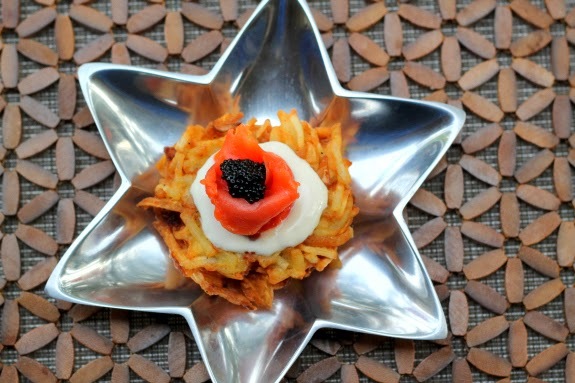 I opted to top my Salmon Latkes with Creme Fresh and Caviar. Heat 1/4" oil in a nonstick skillet over medium-high heat. Meanwhile, combine all other ingredients in a large bowl. Drop 1/4-cup portions of potato mixture into skillet. I used a stainless steel measuring cup, packing the mixture and dropping into the oil. Cook for 5 minutes and flatten with a spatula. Flip and cook another 5 minutes or until golden brown. Drain on paper towels. 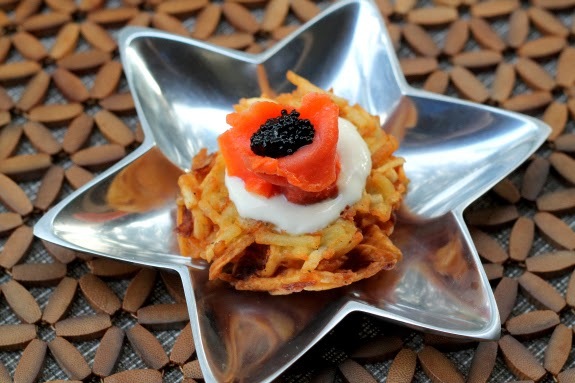 While the Latkes are cooking, take your smoked salmon and twist into rose shapes. 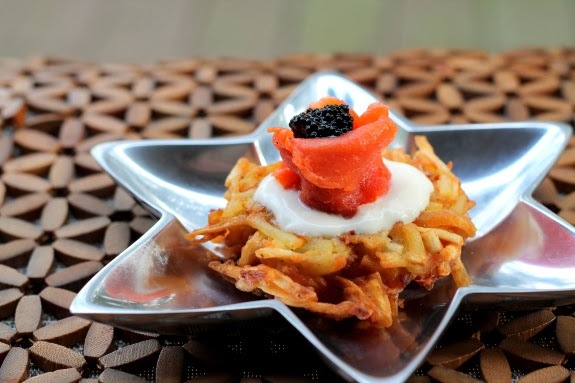 After your Latkes are finished, top with a dollop of Crème fraîche with a teaspoon of caviar on top. Ore Ida has partnered up with Disney for a Frozen Sweepstakes. One lucky family will win the grand prize - a six-day, five-night trip for four to Atlantis, Paradise Island, Bahamas. Included is round-trip coach class air transportation, airport transfers, hotel accommodations, daily breakfast and dinner and $1,000 spending money! Click here to enter today! This is SUCH a pretty dish. It'd make for a really lovely breakfast, heavy snack, lunch, etc! You did such a great job with the presentation and the photos. I'll have to make this soon. Love your comment about Florida football being over :( Trust me, I can relate thanks to many, many years prior to this one.